Beautiful take off performed by one of our students. Wind changed but with a bit of adjustment it was a successful take off. Our training site is situated 30 km west of Dublin and has unrestricted air space in all directions. 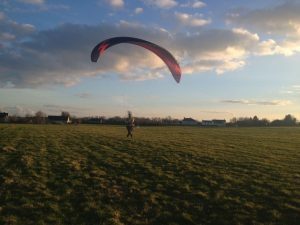 It is perfect to train powered paragliding skills and to admire the views from above. This is official video from last years 43rd Coupe Icare. We have been there! Incredible atmosphere and unforgettable people. Lot of attractions, beautiful views and passion connected friends! We are looking forward for this year on 21-24th of September in St Hilaire du Touvet- Lumbin in France. For more info get in touch. Liam's flight over the training field. Liam used Samsung Gear 360 camera to capture breathtaking around the head view. Perfect view of our training field and an awesome piece of kit! For more info on available courses, equipment and other advices contact Cathal here. Check on Samsung website for current deals and more gadgets here. Parabatix competition in St Hilaire du Touvet on Coupe Icare 2016. We witnessed breath taking evolutions and incredible acrobatics performed by powered paragliding team in France last year. Event surely not to miss!